theta = angle(z) returns the phase angle in the interval [-π,π] for each element of a complex array z. The angles in theta are such that z = abs(z).*exp(i*theta). Create a complex number, and compute its magnitude and phase. 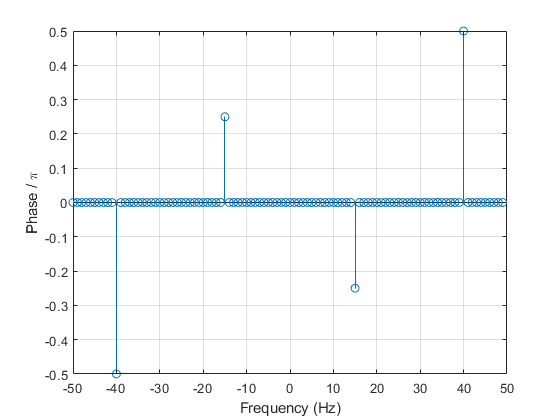 Create a signal that consists of two sinusoids of frequencies 15 Hz and 40 Hz. The first sinusoid has a phase of -π/4, and the second has a phase of π/2. Sample the signal at 100 Hz for one second. Compute the Fourier transform of the signal. 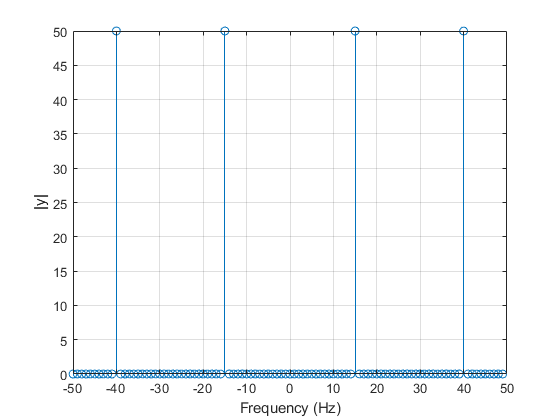 Plot the magnitude of the transform as a function of frequency. Compute the phase of the transform, removing small-magnitude transform values. Plot the phase as a function of frequency. angle takes a complex number z = x + iy and uses the atan2 function to compute the angle between the positive x-axis and a ray from the origin to the point (x,y) in the xy-plane.